Disclosure: This post is sponsored by Upper Darby Summer Stage. Get ready to monkey around with the cast and crew of Upper Darby Summer Stage as the wacky star of the popular children’s book series and hit PBS show comes to life in this brand new musical for young kids and parents alike as “Curious George and the Golden Meatball” takes center stage Wednesday August 2nd- Friday August 4th. 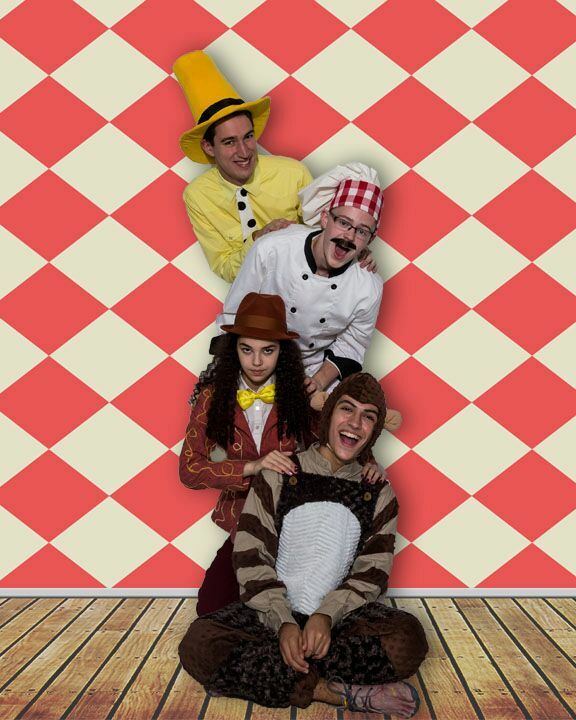 Audiences will be delighted by the antics of the inquisitive monkey George and his owner, the Man in the Yellow Hat, as they hit the stage with new friends, catchy music, and a whacky adventure. This musical is a first for Upper Darby Summer Stage and is guaranteed to be a hit among families with young children. Performances are August 2, 3, and 4 at 10:30 am and on August 3 at 7:30 pm at the Upper Darby Performing Arts Center. It’s All-You-Can-Eat Meatball Day and George couldn’t be more excited! With the help of the Man in the Yellow Hat (Josh Angell of Havertown), George (Anthony Flamminio of Drexel Hill) helps his friend Chef Pisghetti (Mark LaVecchio of Drexel Hill) cook delicious meatballs. But when Phinnea T. Lightspeed (Caroline Borio of Plymouth Meeting) uses the Meatballs O’Matic to steal the hungry crowd away, a defeated Chef Pisghetti vows to quit cooking. To help him feel better, George enters the chef in the Golden Meatball Competition… in Rome. With a monkey like George and a cast of goofy characters, there’s no telling what fun will ensue as George learns about Rome, meatballs, and the secret ingredient to good cooking – and friendship. Tickets just $8 – $12. The show is approximately 60 minutes long, making it perfect for ages 4 and up! Win a family 4-pack of tickets to see Upper Darby Summer Stage’s production of “Curious George and the Golden Meatball“. Tickets are for Wednesday morning, August 2nd at 10:30am . To enter, please enter via the easy Rafflecopter below. Feel free to complete one step on the Rafflecopter (free entry) or as many as you like for additional entries. Winner will be chosen on Monday, July 31st at 12 AM. Good Luck! For more information about “Curious George and the Golden Meatball” and Upper Darby Summer Stage’s 42nd season visit udpac.org. Just joined your site. Would love to see a show! Do I need to sign up with newsletter? Hope to win! Looks like a great family show my family would love!